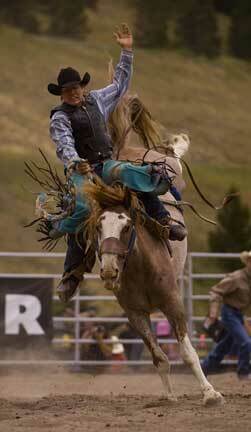 Bronk Busters Rodeo Company was started in 2000 by Matt and Dan Forst. Rodeo has been a part of their lives for over 16 years now, all beginning with their love for horses. Matt Forst having been in rodeo throughout highschool and college as a competitor began his passion for rodeo. Wanting to continue and extend his passion for rodeo throughout his life he chose to become a rodeo and stock contractor. Dan Forst alongside his son Matt, is also pursuing his passion for the rodeo lifestyle by raising livestock and doing rodeo productions. As part of their Born to Buck Program, raising bulls and horses from birth, they have raised a bull by the name of Skitso mentioned above with Bucking Bull of the year in 2006. Bronk Busters was also asked again this year for the 4th year running to hold the rodeo as part of Copper Country in Copper Mountain, Colorado and are the first stock contractors to do such at a top resort. Making great entertainment for the people of Summit County and great money for the cowboys. Along with the various rodeos they also provide the practice stock for the CSU and NJC rodeo teams through the fall and spring rodeo seasons. Dan and Matt also run Forst Cattle Company, in which they breed, raise and sell bucking bulls and horses. For more information on Forst Cattle Company or the Born to Buck Program, please visit our website at www.forstcattleco.com. We will always strive to be honest and dependable contractors. With the good Lord on our side we will always be good role models for the young, up and coming cowboys. Having been on both sides as a contestant and a contractor, we fully understand the needs of our cowboys. We also recognize what needs and assistance rodeo commitees need to have to produce a top quality rodeo production.